Um… What? Huh? Where am I? I had a dream where I was trying to fit six years of my life in a small car and I ran a blog where I reviewed board games and– And– Oh Lord. It’s true. I’m a blogger! I’m a blogger who is moving! Ugh, my head is throbbing, the room is spinning, and what is this game?! Where did it come from?! 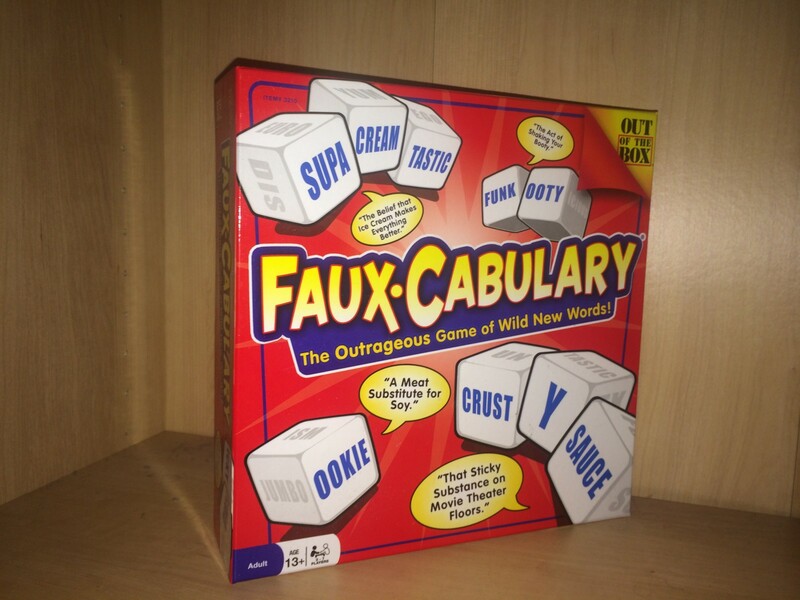 What the heck is Faux-Cabulary? !Several deep breathing exercises later. Okay, so, life is stressful here at Skip-A-Turn. Again. So painfully stressful that there might not be a post from me next week. Not proud of that, I’ll be honest, but as I’ll possibly be lost somewhere in the midwest by that point, it might be better for me to shift my priorities for a bit. This isn’t helped by my co-blogger ALSO moving at the same time. Not as drastically, but still a move. The blog isn’t going to go the way of the Dodo, I promise! The following week we will hopefully be able to have a new review or article for you and it will be super!… Though we’re still working on Battle of the Sexes Part 2. It’s coming. We promise. Seriously. We’ll have your review soon! The appropriate response to a blog begging for your approval. Regardless, this week we have a special guest: Faux-Cabulary. What a… What a game. Woo. Alright, so back in our Drag Ball review we offhandedly mentioned a fact about party games: They are casual, low-commitment games where you can drop in and out at a social gathering and lose nothing. They’re rarely more than “distractions” and the market is flooded with variations of the Apples to Apples or Cards Against Humanity formulas. Faux-Cabulary does nothing to change that. For those who don’t know, these games tend to be a variation of “Please the King”, where one player (the “king”) draws a topic and then other players attempt to match that topic, generally using cards. Faux-Cabulary forgoes cards in place of over-sized plastic dice with words on the side, but the formula remains simple enough to be placed on the side of the box for quick-glance rules: The players attempt to please the king (generally making them laugh, I can only name about three people on the planet who actually care if the submission is accurate) and whoever does so wins the round. Whoever wins the most rounds wins. Faux-Cabulary’s flavor is, obviously, the words you create. A fake vocabulary. Get it? The King gets a topic (“a gross food”) and you take your three dice (or only one or two if you think it’s funny enough) and make a word. Wash, rinse, repeat. As you can see, Faux-Cabulary isn’t new or interesting or innovative. It might just be the linguaphile version of the impossibly popular Apples to Apples. The kicker? That’s not a bad thing. These games do exactly what they’re aiming to do: Be played at a party. You can’t have super intricate detailed rules when you’ll have people being distracted by cocktails and music. Frankly, Faux-Cabulary is entertaining but not super imaginative. Not a bad purchase, and if you’re friends with a bunch of English nerds, go hog-wild. Skip-A-Turn Variation: Can You Use It In A Sentence? : Players have to use their words in sentences properly. If they can’t? Take a shot. This Post was posted in Board Game Reviews, Concurrent Action Game, Family Game, Party Game and tagged board game review, fauxcabulary, fauxcabulary review, Skip-A-Turn, skipaturn. Bookmark the permalink.